These systems have an ENORMOUS profit margin so beware of overzealous marketers and sellers of these machines in making exaggerated claims in order to make a sale. Many distributors make over $6000 selling just one of these high intensity machines. Read this article along with this website and my book on PEMF before you jump into a big purchase you will regret. All these high voltage machines are basically modeled after the original Papimi PEMF device, which was outlawed by the FDA in 2005. 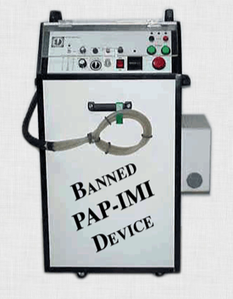 These devices are sold in different packing and under various names and are clones of the old PAP-IMI devices. These papimi-like machines are VERY expensive starting at about $10,000 and going up in price to over $30,000. They use VERY HIGH intensity coils shooting "bursts" of pulsed magnetic fields for just microseconds. Also its important to note that the random discharges of energy create frequency spectrum containing both good and harmful PEMF frequencies. Unfortunately the dangerous radio and microwave frequencies similar to cell phones, cordless phones, etc. are present too and at very high intensities (upwards to 30,000 volts and over one Tesla magnetic field strengths). So basically its like sitting next to a high voltage power line. I personally know a couple health practitioners that STOPPED using these devices because of the irritating nature of high voltage energies. These high voltage PEMF systems are mainly sold for pain relief and pain related issues. Yes they can and do provide symptomatic relief, but low intensity PEMF systems do as well. The problem with the "More is Better" approach is that usually there is a price to pay for using substances or energies that are NOT natural. For example, pain medication ALSO relieves pain and does so very well, but that does not mean it is safe or healthy for your body. Just the contrary, pain medications have known side effects on the liver, kidneys and stomach and can even be so addicitive that rehab is needed (like with morphine, oxycontin, percocet and vicodin). I am not saying that high intensity PEMF systems have the same side effects, but they are definitely not natural and could be potentially harmful if not used under the supervision of a doctor or a person experienced in using these machines. Both the higher intensities and frequencies found in high voltage, high intensity PEMF devices are NOT found in Nature, unless perhaps you are struck by lightning. This is why I refer to these high intensity PEMF devices as Allopathic Energy Medicine, because they basically hit the body over the head like a proverbial sledgehammer with unnaturally high intensities and frequencies. The result, like pain relief drugs, is some symptomatic pain relief, but at the cost of working AGAINST the body's natural healing process. This is diametrically different than a more natural and homeopathic approach that works WITH the body and its symptoms to gently and MORE EFFECTIVELY help the body to heal better and faster. "More is Not Better. Better is Better"
Longevity studies prove that a lower calorie diet increases lifespan in all species of animals tested across the board. Dr Walfords studies are conclusive! Its not debatable anymore. The only caveat is you need nutrient dense food (Better is Better). The key is quality, nutrient dense food and eating LESS of it. In fact, there are many more examples where LESS works better, and smaller is more powerful. In natural healing the science of homeopathy most clearly demonstrates this principle of better is better and sometimes less is more. In fact the most potent homepathic solutions are the most dilute! Yes you heard me right, the highest potency homeopathic remedies have the least amount of substance in the solution, so what is left is the pure frequency resonance that stimulates the healing response in the body with the least side effects. This is the exact opposite of allopathic medicine. The prefix "allo" means "other", or in this context "against". The mindset is fighting disease and suppressing symptoms INSTEAD of working with the body's near infinite intelligence that it has to heal itself. "Homeo" means "same" or "with" and homepathy works "with" the body by gently stimulating the very symptoms of the disease. By carefully mapping the symptoms of a patient, a good homeopath gives a remedy to precisely match those very symptoms BECAUSE these symptoms are the energetic signatures of the human body's healing response. The purpose of diluting the solutions is to minimize the symptomatic response and support the body's natural healing response. 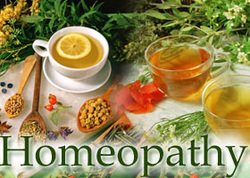 Here is the key: Homeopathy works WITH the body and its ability to heal itself. Allopathic medicine works against by suppressing the symptoms and partially shutting down the body's healing response. NOTE: Its a known fact that children have died by suppressing their fever with medication. Why? Because the fever is a healing response that BOOSTS the immune system to fight a disease. Yes a fever can get too high but this is rare especially if you are well hydrated. High Intensity PEMF systems are ALLOPATHIC in their nature, suppressing symptoms and overriding the body's natural healing response. Low intensity PEMF, that is close to Nature's frequencies and intensities works WITH the body, promotes the healing response and overall leads to better healing and regeneration (see NASA study conclusions below). The Schumann Resonance Intensity is Only around 1 Picotesla? Note: Check out the page on this site on *Frequency* to fully understand the importance of the Schumann frequency and its higher harmonics, especially in the 0-30 Hz frequency range. Now I want to point out something rather astonishing. As essential as the Schumann resonance is for life and the health of our body, it is an incredibly WEAK PEMF signal. What that means is very sensitive antennas are needed to tune into the Schumann resonance. And guess what? The organic magnetite in your body along with other biochemical crystalline arrays act as powerful receiving antennas to tune into the Schumann and amplify its signal. And there is a reason NASA and the Russian space program have used Schumann generators in their space capsules... Because its essential! Also Dr Rutger Wever's pioneering research in underground bunkers along with zero field studies have further proved that the weak PEMF Schumann signal IS essential for life. And it's a very weak signal confirming that frequency resonance is the key (like homeopathy), NOT INTENSITY! A picotesla is one trillionth of a tesla. That is one picotesla = .000000000001 Tesla. How can high intensity PEMF devices that are a trillion times stronger than the essential Schumann intensity possibily be safe and good for us? The NASA Study Confirms that Low Intensity is MORE effective! 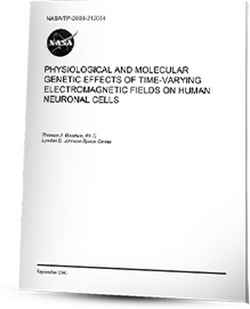 So again look for yourself at the NASA study on PAGE 12 of the study (page 18 of the actual document). Along with the FACT that the Schumann resonance is only 1 picotesla, this 4 year, multimillion dollar NASA study is the BEST proof that lower intensity PEMF is the way to go, and that there is NO REASON to waste your money on higher intensity systems that cost $10,000-$30,000+++. I have talked to literally thousands of people about PEMF therapy and A LOT of people are confused about intensity, Gauss vs Tesla, what is uT, etc. Tesla is the SI unit for Magnetic Field Strength or Magnetic flux density. This unit is the overall strength or intensity of the magnetic field around an object and decreases with distance. Gauss is another unit for Magnetic Field Strength and it should be noted that Tesla and Gauss BOTH MEASURE THE SAME THING, just like Meters and Yards both measure distance. These prefixes apply to ALL units of measure in science. Hopefully I can best illustrate all the units by using the familiar earth as an example. Many PEMF devices use Microtesla because the Earth itself is 33-66 Microtesla from the Equator to the Poles. In Gauss this would be .33-.66 Gauss. But its VERY important to note that this is the Strength of the Earth's DC or Static Field. The earth also has a pulse, or a frequency. The primary frequency of the earth as we discussed is the Schumann Resonance which has been proven to be essential for life. But the Intensity of the Schumann is only 1 picotesla or about 1/50,000 the strength of the earth's DC field. So much for the More is Better Myth. The earth's ACTUAL PEMF (not static field) is incredibly weak, which the NASA study confirms that we weaker PEMF fields actually worked BETTER!! And they are more safe. 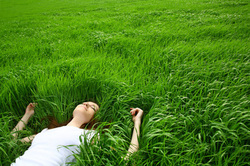 High Intensity systems like to claim that lower intensity PEMF devices are ineffective because you can just lay on the grass to get the earth's natural field strength. Well, we just exposed the flaw in this reasoning. Laying on the grass is giving you a PEMF intensity in the picotesla. Earth Based PEMF mats actually give you a VERY concentrated PEMF intensity compared to the earth. Again we are talking about PEMF, not the earth's static field. Many static magnetic products use intensities that are upwards to 12,000 Gauss or around 1.2 Tesla. But interestingly the NASA study, Eastern European Studies and others showed that static magnetics do not work as well weak PEMF signals which are more effective than stronger static magnets. In fact when magnets were first rigorously studied in Eastern Europe in the late 70's and 80's, they found that PEMF or pulsing magnetic fields worked better, so much of the research shifted to PEMF. Since then over 10,0000 studies have been conducted with PEMF therapy making it the most effective, best researched form of energy medicine available today. Just remember that More is not better, BETTER IS BETTER. And in the case of PEMF therapy, most of the time, less is more beneficial! Plus if you believe that what the earth gives us, is mainly what we need, than it should make sense that supplementing with a earth inspired PEMF therapy mat with lower intensities is the most effective, most natural and safest way to go!